Note: Flip It has been updated to a larger 2nd generation model. Links in this article now point to that new model. The image to the left is the new model and all images have been updated in this article! This article will give you more info about Flip It the 2nd generation! 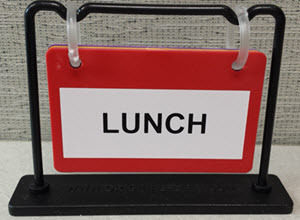 I love cubicle accessories and sometimes you come across an office item that is so simple, you wonder why someone didn’t think of it a lot sooner. 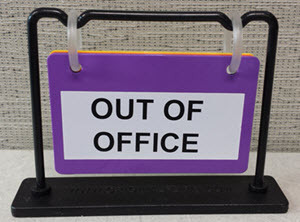 There have been many times when I have updated my Outlook email to send a notification should I be out of the office, in an extended meeting, or on a break. But what happens when someone just happens to drop by your office looking for you? Well, Flip It is the answer! (Check out my office images further down in this article). I saw this office item online and I ordered it recently from Amazon.com. I've been using it for the last couple of weeks and I must say that it certainly does the job for me. Let’s say, for example, that I’m heading off to a meeting for an hour or two. I don’t typically add any type of message to Outlook since it’s such a short time but FlipIt does the trick for me. 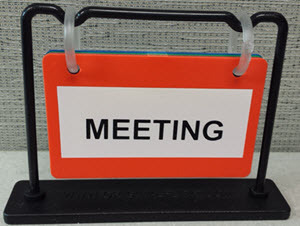 I simply flip the tab to Meeting, leave it either on my keyboard or just in front of my keyboard, and when someone drops by looking for me, they have a visual signal that communicates to them that I am in a meeting. It’s simple, yet very effective. You can also affix it to either the top of your cubicle wall, your desktop, your flat panel monitor, or wherever you like with a handy adhesive strip attached to the base. But, to be honest, I haven't decided yet where I want to stick it, so I'm leaving the cover on to the adhesive strip for the time being. 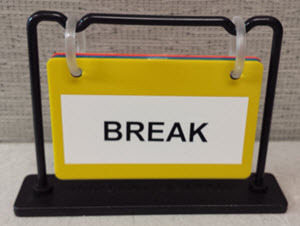 When I leave for the day, I can flip it to Out of Office or if I am taking a break I flip it to Break. 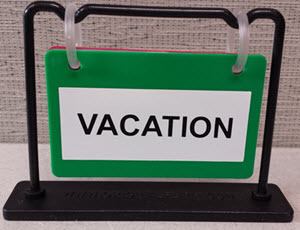 The five color-coded statuses that are available with this cool office accessory (including the associated color), are the following: Meeting (orange), Break (yellow), Out of Office (purple), Lunch (red), and Vacation (green). These 5 options work for me and I think these are the only ones that you really need. 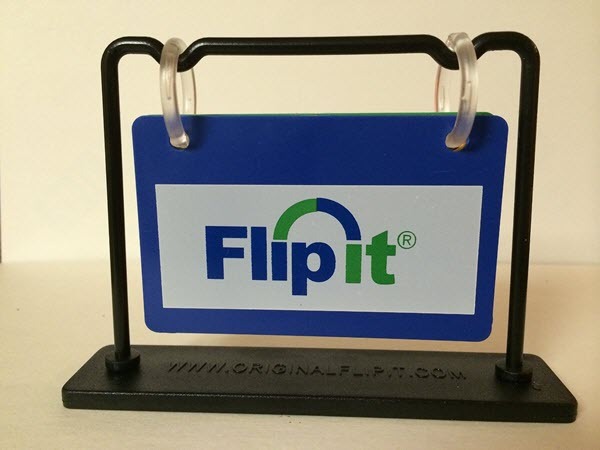 Features of Flip It, the Cool Office Accessory! I did notice some reviews on Amazon that complain about the fact that it may be too small. That's OK because there is a new 2nd Generation model that you will see when you click on the links in this article. As I mentioned previously, Flip It comes with an adhesive strip on the bottom if you wanted to attach it on top of your monitor or on the top of your cubicle wall. I just use mine on my desktop and oftentimes just place it directly on top of my keyboard as you can see in the images above. I like the fact that I can move it around instead of fixing it in one location by using the adhesive strip. Another visual indicator for the office that I recently wrote about is called The Daily Mood which I wrote about in this article. So, if you are looking for a way to improve the communication within your office environment, Flip It will help let your co-workers and your boss know where you are at all times. It's simple, but effective and worth the very small investment. At least it is to me. And if you want to help make your office cubicle like your home you might enjoy this article. 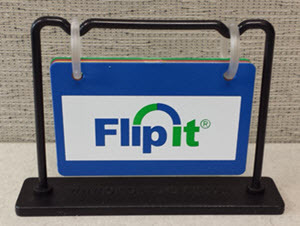 If you have any questions at all about Flip It or any other cubicle accessories and products on this site, please leave a question in the comments or Contact me. Wow! I am impressed and I am humbled by your article on Flip It! I am the creator of Flip It and I found this article by searching for images of Flip It on Google. I clicked the picture and it took me to your article. Thank you very much. I just shared your article on the Flip It Facebook page! I am honored that you think so highly of my product! I have one and use it often. Sometimes it’s good to have a visual out-of-office instead of always relying on Outlook or any other email program that you use. I know the woman who created this product and her sales have done very well. It’s an example of a simple product that solves a problem. The flip is a nice idea, I usually tacked a sheet of paper on my chair but would have to look for the paper that said where I was and 9/10 times would write it over again. Cute product..